VIPS has a number of "signature" programs, as well as countless opportunities to get involved in classrooms, clubs, activities, and events, with commitments ranging from once a year to once a week to every day! We can find a way for you to get involved in Falmouth Public Schools in a meaningful way that works best with your schedule. We've included a description of our programs below. However, if these aren't what you are looking for, we have many needs for volunteers to assist in classrooms, "behind the scenes," chaperoning field trips, assisting with fundraising events or school-wide activities, participating in career events, student debates, gardening projects, technology projects, senior project reviewers, tutoring, and so on! If you have a skill or hobby that you'd like to share, let us know. VIPS oversees school-based mentoring programs: Project RISE (Raising Interest and Self-Esteem, for students in grades K-8) and the Falmouth High School (FHS) Mentor Program. Project RISE (initiated in 1994) and the FHS Mentor Program (started in 1999) are two of VIPS' hallmark programs. They grew out of a need-identified by school adjustment counselors-for caring individuals who could spend an hour a week with a student to serve as a role model, supporter, and friend. While many students in need of a mentor are considered to be at-risk for one or more factors, other students come to the program because they have recently experienced change or trauma and may be finding it hard to cope. The child's needs may "fly under the radar" in that the child's academic performance may be unaffected by the change, while his/her emotional and social abilities may suffer. A mentor can make a significant difference in that student's self-confidence and self-esteem. VIPS provides an orientation and training program, along with match support and ongoing opportunities for mentor training and education. This program requires a one hour per week commitment during the school year. One of VIPS' longest-running programs is the Cross-Age Science Teaching Program, or CAST. Cross-age or “peer teaching” is not new, ye﻿t its effectiveness—and popularity—remains strong. CAST involves 8th graders at the Lawrence School working with third graders at each of Falmouth’s elementary schools. CAST incorporates hands-on science teaching based on the third grade energy curriculum. In surveys, participating elementary teachers continuously rate this program “excellent,” find that their students retain most of the concepts covered by the program, and love the peer teaching component. Since 2008, CAST has run throughout the school year to serve every third grader in Falmouth Public Schools--315 students! This involves the participation of over 60 eighth graders each year, who attend after-school training sessions and make three visits to an elementary school. 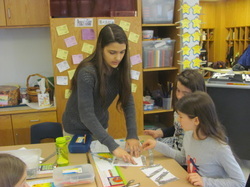 At the elementary school, the 8th graders works with small groups of 3rd graders. CAST sessions are designed to enhance the third grade energy curriculum, focusing on electricity and electrical circuits. VIPS, in partnership with Falmouth Human Services, introduced the Girls Circle program to Falmouth in 2009. The Girls Circle program uses a strengths-based, skill-building approach that creates a safe space for girls to address risky behaviors, build on protective factors, and improve relationships in a format that interests and engages girls. Led by volunteer co-facilitators, the program is run after school once a week for an 8-week session. The themes are age-appropriate and engaging, and each session involves a variety of hands-on activities and cooperative work. Volunteer co-facilitators are always needed! We currently run Circles in grades 4-8 and at the high school level. VIPS believes that the early introduction of career awareness, advice, and exploration benefits students in their selection of coursework, volunteer opportunities, and after-school activities in ways that are both meaningful and relevant to their post-high school success. Working with district guidance staff, administrators, and educators, VIPS involves community partners to create a multi-year, ages/stages approach to introducing career education and community service opportunities to students. In addition, volunteers and community members help students gain “employability” skills, including collaboration and teamwork, responsibility, professionalism, problem solving, and ethics. These opportunities are in addition to programs offered to students through the guidance staff and faculty at each school. Collectively, the goal is to prepare students for their futures, be it further education or entering the workforce. The VIPS Challenge Program is a volunteer-supported program geared for highly motivated students in grades 3 and 4, in the subject areas of Math and English Language Arts (ELA). Volunteers involved in the VIPS Challenge Program work on a weekly basis with small, flexible groups of “talented, eager, and motivated” students to extend the core curriculum. Each week, the group will meet for approximately 50 minutes. Students are referred to the VIPS Challenge Program by their classroom teachers. 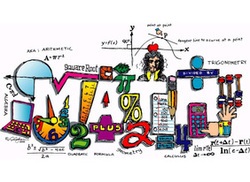 A student can be recommended for either Math or ELA, or may “qualify” for both groups. 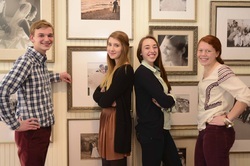 The Challenge Program presents students with opportunities to investigate connections and spur creative thinking, encourages new approaches and techniques to problem-solving, and provides opportunities for high achieving students to collaborate with and motivate each other.